Babcock donations to help fix the running trails for Gristmill Grinder and Sticks & Stones Run. As many of you know, June 24th 2016 in WV we experienced flooding of the “1000 year” proportion. So many of our local communities were impacted and even devastated. So much personal loss even in our running community. What you may or may not know, Babcock was given a hard hit. Most of the park was spared however the Narrow Gauge and Sewell Road sustained major damage. 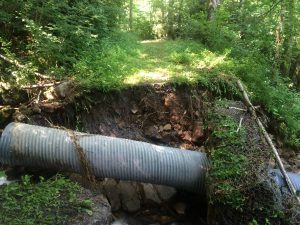 We waited until now to share as the park just met with FEMA recently about a culvert on Sewell Road. The culvert is on the way up to the Gristmill as you run up, just before the pavement and cabins. 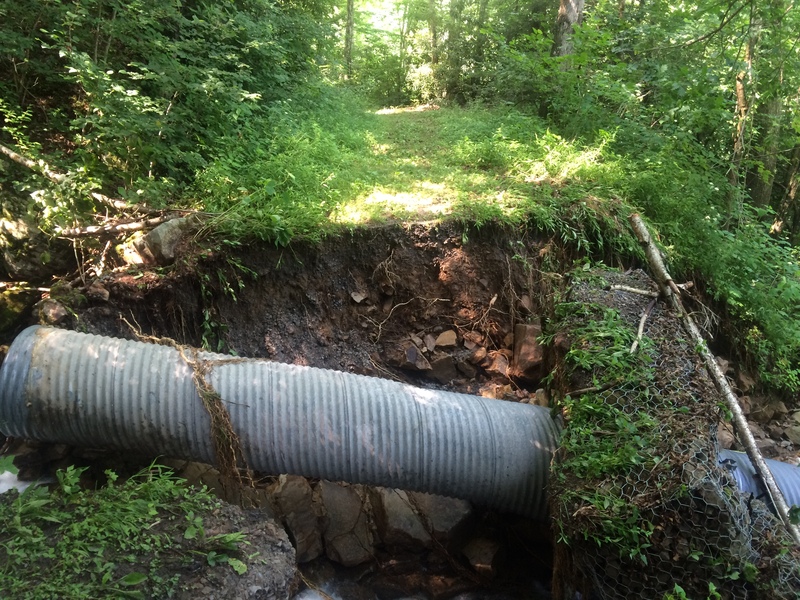 A tiny creek and cute waterfall ripped out the culvert leaving a washout about 20′ wide and 16′ deep. Narrow Gauge has been closed since then. Plans are underway for the repair, though it may well impact our course. We do have a great Plan B though! The good news – and important – we CAN help. We are organizing a trail work day and you can email me for the volunteer form. Please do. Also – we are able to make donations to the WV State Parks Foundation and earmark them for Babcock. These funds are tax deductible and go directly – and quickly – to the park to be used. This will greatly speed up the cumbersome process the park must go through for this repair. I have been through this whole online process and it is easy. We are able to donate to the park of our choice whether you mail it in or do it online. If you donate online then at the end you click “Add special instructions to the seller” and specify Babcock. You will get an immediate email confirmation and a letter from the foundation next day. Please share and spread the word – this is an urgent issue as 1.5 miles of the S&S course and also Grinder are closed. Let us come together to help Babcock – Babcock is a very special place…. and right now we need to show that. Thank you all– Happy Trails!